There's nothing that gives us greater pleasure than when we receive an unsolicited comment from a user of our software. Below are a few of them and you can find many more on our Facebook page and Capterra. 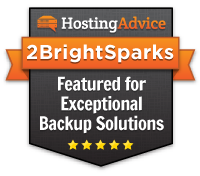 The 2BrightSparks team has tailored their backup and recovery solutions to focus on flexibility. We appreciate the fact that SyncBack users can customize the queue of backup processes to align with their business priorities, and we see the SyncBack software as a secure, balanced solution to backup needs — data protection meets system performance. Well done, 2BrightSparks! We recently replaced an extremely expensive Enterprise backup solution that was costing us thousands of dollars per year (with limited storage) with SyncBackPro. Not only does it save us a ton of money, but the product actually works BETTER than the expensive enterprise software! We couldn't be happier. SyncBackPro is by far the best backup software on the market. I don't normally send unsolicited praise to software product developers, but in your case I'm moved to do so. I just wanted you to know that I am extremely happy with all aspects (functionality, reliability, ease of use, documentation, etc) of SyncBackPro (and SE as well). Also I am impressed with your customer communication practices and your very reasonable update/upgrade policies. SyncBackPro is the most powerful backup and synchronization utility in its class. Having a backup of your information is more vital now than ever before... There are many such utilities on the market, a lot of which I have tested personally over the years. But none are as useful and user-friendly as the subject of this review: SyncBack Pro. SyncBack Pro is a VERY powerful program. It can make your digital life almost worry-free, as far as file integrity and redundancy goes. The verified copy function alone makes it well worth the cost. A simple Windows Copy command doesn’t give you that - you actually would have no idea if a file was copied correctly or not until disaster strikes, and you need the backup file. By then, it would be too late. I’ve recently run many backups of my digital image library between my NAS box and external drives. Over 40,000 files each time, and not a single problem reported or found. This app simply works... and works very reliably. A definite must-have for the serious computer user. Mark Mattson, Computer Users of Erie. US. SyncBackSE was awarded a World Class Award within six months of its launch in the utility category, July 2005, by PC World Magazine. The winners showed "exemplary design and usability, features, performance, innovation, and price". "World Class Awards set the standard for excellence in the high-tech and consumer electronics industries," stated Harry McCracken, editor in chief of PC World. Now in Version 7 and with three versions - SyncBackFree, SyncBackSE and SyncBackPro, everyone can backup using the best there is. I haven't had to worry about reliable backups in years. (In fact, I've just run one now.) I've received *real* value for my paltry investment, and I have nothing but praise for software that works, and works extremely well. (If only that was true of other vendors...) I've long recommended you guys to friends. If anything, it works *too* well: so many options to consider! But for OCD types like me, it's ideal. Just wanted to say SyncBackPro is a great product. My company just moved to office 365 email system and getting the log email setup was super easy. Also of great benefit was the shared email settings feature, saved so much typing time. Awesome work 2brightsparks. "...SyncBack freeware, an incredibly robust backup utility that backs up or synchronizes data between your hard drive and an external drive or FTP server (for off-site backup.) Configure multiple profiles to run at times you schedule, and get email notifications if something goes wrong..."
Lifehacker has received rave reviews as an outstanding blog and was Wired Magazine's Best Blog in their annual Rave Awards ceremony. Lifehacker has also been mentioned in The New York Times, Wall Street Journal, and PC Magazine. I have no reason to write except to tell you that SyncBackSE has probably been the best money I've ever spent for software. Thanks a lot. I really like SyncBackFree... been using it for years. I have to say that this was one of the best customer service responses I've ever seen. And I've seen a lot (I actually teach a university course on customer service best practices). I didn't realize they [SyncBackSE and SyncBackPro] could be installed in parallel and had assumed the upgrade would overwrite the free version. That is awesome that it doesn't. Thanks for further reinforcing my confidence in your company. I find SyncBackSE extremely useful for backing up my files. The profiles are easy to set up and run. Whenever I talk to friends about backup I always recommend SyncBack. Our company has been using SyncBackPro since 2012. We run a Windows-based office network and have found this program to offer exceptional reliability. SyncBackPro provides us with the required versatility to manage backing up our data. The particular reason we use SyncBackPro over the SycBackFree version is its ability to created versioned copies of our database to safeguard against data corruption events. We are not fully cloud-based and therefore back up to a fire and flood proof drive. However I do know that SyncBackPro has the capability to back up our data to cloud-based services with no problems. SyncBackPro: It Saved My Skin! SyncBack is one of the best programs I have ever used. As soon as I tried the free edition I knew that I wanted to buy. After using SE for 5 years I got a new computer and the first program to go on it was SyncBackPro. I didn't even need to evaluate it - I've come to trust that you know what you are doing, and deliver great value for money! For any Windows developer, SyncBackPro is the ideal backup solution - delivering all you want through a superb UI and working reliably for month after month. It has saved my skin quite a few times. Without a doubt the best backup software I have ever used. So powerful and infinitely capable. Thank you for your service, long may it continue! 2BrightSparks has unveiled SyncBackSE 7 and SyncBackPro 7, a major update for its powerful backup and file sync application. Thank you for your amazingly expeditious response - especially late on a Sunday evening! I was already a big fan of SyncBackSE, having recommended it to several of my colleagues; but this superb customer service effort has me all the more excited to recommend not only your product, but your company. THANK YOU VERY MUCH! Polite Upgrade and Excellent Software! I've just upgraded to version 7. Usually when software vendors do this periodic upgrade ambush, I get very annoyed. But you have made the process so transparent, and so "undemanding", clearly giving the opportunity to continue with the old version, that I was positively pleased to pay for the upgrade. And it's excellent software too! 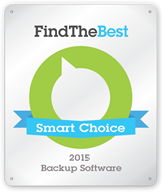 SyncBackPro has been awarded and recommended as top rated file backup and file synchronization software by Web Hosting Search. "SyncBackPro is superb software that allows webmasters to gain full security of their site and its content by backing up all its data..."
SyncBackPro has achieved a 100/100 Smart Rating in 2011, 2012, 2013, 2014, and 2015 which reflects the weighted average of scores from the most trusted experts. SyncBackSE was #1 in the People's Choice Awards voting through PC World for two consecutive years. You'll be pleased to hear that today SyncBackSE has improved a great deal since being awarded the People's Choice Awards as a result of constant updates, and SyncBackPro delivers even more power and performance. SyncBackSE received the largest number of votes through PC World of any software product in the 2007 and 2008 Shareware Industry Awards. The SIAF "People's Choice Awards" were created so software users would have the opportunity to vote for their favorite software programs. While we have numerous awards from technical reviewers, being selected as a People's Choice winner by the public gives all of us at 2BrightSparks the greatest pleasure, and is the best indication that our software should be your choice too. Thank you for providing this software for so many years. I purchased SyncBackSE for my business years ago, and have enjoyed it ever since. I recommend it to ALL of my customers - PLEASE continue along the same path, making quality software honestly, and representing it clearly and plainly. So many companies fail miserably at making software appealing - you all do a great job. Thanks! I use SyncBackPro to backup my voip servers and it is wonderful. You should be very proud of this product and the company behind it. Merry Christmas and thank you for such a wonderful product. I started with SyncBack Free and purchased SE as I needed support for copying open files. Your prices and license policies are more than fair and your software is excellent. This is how software should be done. Well thought out, great UI, helpful options galore. You have a fan and customer for life. It is very well-designed, simple yet powerful, and so well-priced. It's an example of excellent software development. Bravo!